Brazil is home to some of the most passionate esports communities, fans, pro gamers and audience members around the world and is growing rapidly every day. With several Latin American esports leagues established for Counter-Strike: Global Offensive, Dota 2, League of Legends and many other up-and-coming esports, it’s no surprise more and more Brazilians want to watch their favourite games played professionally. If you live in Brazil and want to bet on your favourite international and home-grown esports tournaments, teams and players, our guide will show you where to find the safest and best esports betting sites with secure deposit and withdrawal methods in Brazilian Real currency, BRL sign-up bonuses and all of the latest esports betting markets, not just the big games like CS:GO and LoL, but rising stars like Halo, Hearthstone, Overwatch and Rocket League. Keep this page bookmarked as we keep you updated on the latest changes in Brazilian esports betting. Despite the country’s very complex and sometimes head-ache inducing online gambling laws pertaining to Internet sports betting (which, for now, is the category esports falls under) it is perfectly fine for Brazilian players to place bets on their favourite esports matches, players, and teams at both local and offshore licensed and regulated real money betting sites. Click on any of the links below to read in-depth reviews of each online sportsbook for more specific information, and get started by signing up and redeeming your exclusive welcome bonuses for extra starting cash. 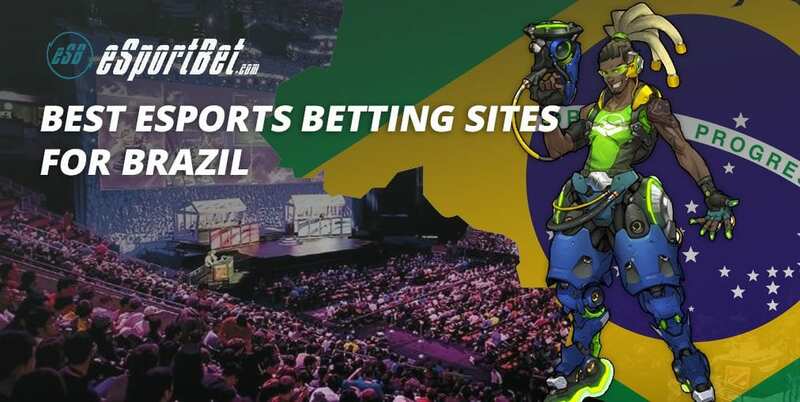 For Brazilian esports bettors, these sites are some of our top recommended picks because they offer a Portuguese language option and are fully regulated to protect Brazilian and international players who bet on esports, even if they’re based offshore. Bumbet and Betsson also both fully supports the Brazilian Real (BRL), meaning when you deposit money to place bets on esports, you don’t have to worry about currency conversion and the fees associated with it. Still, that does not mean any of the other recommended betting sites that accept Brazilian players are worse – you can still bet at those sites, but you just have to be prepared to convert your BRL into AUD, CAD, EUR, GBP or USD before placing your wagers on esports and other markets. Check out our beginner’s guide on how to bet on esports to learn how esports betting markets and online sportsbooks work before you sign up to any of these sites. Is it legal to bet on esports in Brazil? Yes, if you live in Brazil you can 100% bet on esports and any other sporting or racing events at the online betting sites we recommend on this page. Current gambling legislation in the country is restrictive on operators, not the bettors. Brazil’s online gambling laws, which encompasses esports betting, have always been incredibly strict and complex, but they have never successfully punished bettors. The Law of Misdemeanours was enacted in the country in 1941, banning “games of chance” offered to citizens that are either accessible to the public or held in the public place. Despite being established long before the Internet, the law is generally interpreted as covering the virtual space by many regulators in Brazil, thus making it illegal for businesses to offer gambling services in Brazil period. However, the legislation’s ambiguity has led to a thriving gray market where offshore online sports betting sites licensed in other countries can simply cater to Brazilians who bet online from the privacy of their home, of which that is not punishable. The Brazilian government has unsuccessfully tried to completely ban online gambling in the past decade. In 2008, the first attempt to pass a bill banning real money betting on the Internet failed, as did an attempt in 2009 to force Internet Service Providers to block their customers from accessing overseas-based gambling websites. In 2010, the Brazilian government failed to block their citizens from processing transactions related to online gambling, though since 2011 the government did ban online sports betting transactions processed via credit and debit cards. The Brazilian Congress has debated the current prohibitions and many developments have occurred that may see the existing online gambling laws modified in the near future. Since 2014, the Senate Bill No. 186 has aimed to authorise and regulate the exploitation of games of chance by private enterprise, which includes online sports betting. Essentially, if successful, Brazil could see a fully regulated online esports and sports betting market open up without the legal ambiguity. For now, it is perfectly safe and secure for Brazilians to bet on esports at offshore licensed and regulated EU online sportsbooks while the country gets its act together. Brazilians betting on esports, either on their computer or their mobile phones, are never punished with fines or penalties and there have been no publicly recorded high-profile incidents which could lead people to think otherwise. Most of the sportsbooks we recommend Brazilian esports bettors register an account with offer a variety of globally trusted and secure payment methods such as bank transfer, credit and debit cards, along with local options popular in Brazil such as AstroPay and Boleto Bancario. Depositing money into your chosen online sportbook to bet on esports is an extremely simple process. While every betting site has a different interface, the general process remains universal: Sign up for an account, verify your details, login to your account and visit the ‘banking’ or ‘cashier’ section of the site (many sites will often re-direct new registered players to make their first deposit automatically) and choose from the list of payment options offered to process your first deposit. You can process withdrawals in the same section once you have won any bets, though some services are unable to be used as both a deposit and withdrawal method – double check what services are available and preferable for your use prior to depositing. How popular is esports and video games in Brazil? According to insights from NewZoo, there are over 11.4 million esports enthusiasts recorded living in Brazil in 2017. Alongside the rest of Latin America, these Brazilian fans were responsible for 2% of the $32 million in total ticket revenue earned from major esports events in 2016 (around $640,000) and there were around 16 pro gaming events held in the region (out of 424) that year with prize-pools above $5,000. Brazil and the rest of Latin America also accounted for 1% of the total recorded $93.3 million in major event prize money handed out to esports winners in 2016 (around $933,000). Brazil is one of the most fascinating video gaming markets in the world. Despite long-term economic problems, there are over 66.3 million gamers in Brazil who will spend $1.3 billion in 2017, making it the 13th largest video games market around the globe according to NewZoo. About 41% of console gamers in Brazil are female, mostly aged between 21-35, and mobile gaming revenue from the recorded 79.6 million smartphone users in the country is expected to eclipse both PC and console gaming revenues combined by 2019. Clearly, Brazil loves its esports and video games. Brazilian players are recommended to check out Bumbet, one of our top rated and reviewed esports betting sites for the Latin American region. Redeem your exclusive welcome sign-up bonus and bet on your favourite CS:GO, League of Legends, and StarCraft II pro teams.